As we have shared previously, to the African mind a building is everything. It communicates strength, authenticity, reality, choice, and validity. According to Scripture, the people of God are the church of God; He no longer dwells in houses made with hands. Being the recipients of generations of Christian heritage, we Americans are comfortable with church meetings in rented school classrooms, storefronts, or homes. In our culture, validity is inherent for the simple reason that our Constitution allows varied expressions of religion without censorship. And we are strong in our understanding of spiritual truth. As the foundation and walls are placed, a sort of metamorphosis occurs. Wills bend, minds open, hostilities are checked. No, all is not peace. But there is a sort of truce called. Before the building, it is open season on Christians. When the church building is completed, enemies think twice before assaulting, burning, or killing the Christians represented by that building. Not only does a building affect the level of persecution. It also affects the growth of the church. Without a building, many people are “sitting on the fence,” watching to see what will happen. Is the Christian God strong enough to provide a building for His worshippers? Is this religion here to stay? Do I really want to “switch sides” when the persecution is so strong? As the building goes up, the resistance to conversion goes down. Many want to come to Christ, but they are afraid. Their faith is weak. It has been documented that the presence of a church building in Muslim lands is a strong help in conversions. At this time last year, we were sitting with the Alaba Town church leaders discussing the situation of the Lord’s church in the Alaba district. (The Town Church is the mother church of all the churches in the Alaba district.) After many, many years of overt persecution, the Town Church finally had experienced a measure of rest from persecution. Part of this was because of the growth in the church property and ministry; the community was now feeling the impact of the presence of Christians. But in the rural areas, small congregations were meeting secretly in huts. 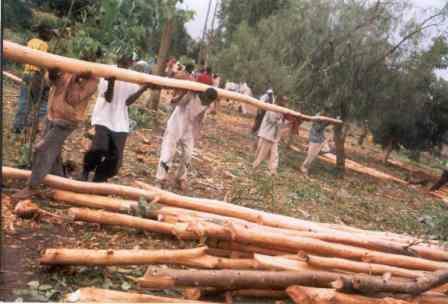 When discovered, their huts were burned, their children kidnapped, their possessions robbed. 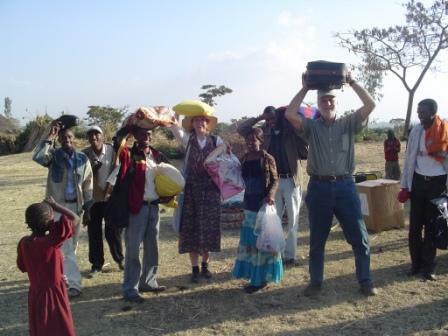 The Town Church people were doing their best to help the rural believers. What resources they had were spent on restitution, medical care, legal expenses, and shelter. Although the leaders knew that the erection of official church buildings would help these persecuted believers, there simply was no money for such building. 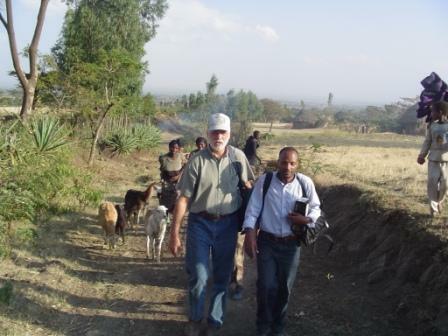 A year ago Dave and I stood in the homes of the persecuted. We heard their testimonies. We saw their burned homes; we wept with bereaved parents. We witnessed their faith and hope that one day they would have validation as local congregations. And we did the numbers. $2,250 would cover the cost of a simple rectangular church building. In the providence of God, He sent people to help with the cost of these buildings. We needed funds for 9 churches. Church after church here in America stepped forward to adopt a rural congregation in Alaba. Individuals, families, and associations did creative things like hold auctions, sponsor concerts, sell stew, hold car washes, etc., to raise funds. 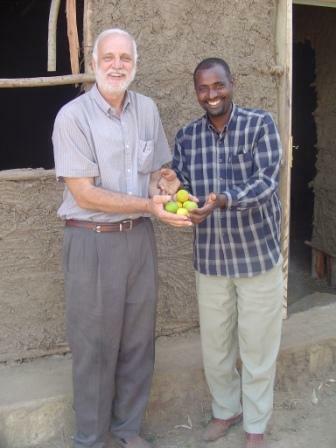 As the money came in, the economic situation in Ethiopia hit hard times. Inflation skyrocketed. The cost of cement tripled in just 6 months. Now the same simple church building cost $4,000! And yet the Lord of the Harvest continued to direct His faithful ones to the work. And so we’ve moved forward, trusting that in His time and in His way He will provide the funds needed when they are needed. We must not look to the end, as if we need all the money now. We need only the money now that we need now; the future need will take care of itself. While in Alaba, we visited 4 churches that stand because of our obedience to His will. Keranzo #2 was the first one to be completed. This church sat half-completed for years and years. The walls were wood branches without any mudding. No windows or doors were in place. Imagine meeting in such a place week after week. What were the neighboring Muslims thinking of these “poor Christians whose God can’t even provide a meeting place for them.” We sent a love gift of $2,000, and it was completed. The shame in the neighborhood was removed for this little congregation. 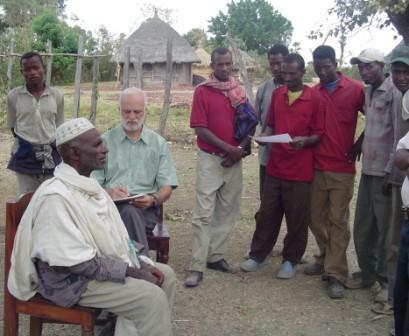 Hajji Usman and his son are the primary leaders in this little congregation. Hajji Usman used to earn a high salary from Saudi Arabia as a teacher of the Quran. Now he serves the Lord Jesus in greater material poverty, but in immeasurable spiritual wealth. Visiting Galiye Church on the mountainside. The church in Galiye was the second church to be completed. This church sits on the edge of a mountain; it overlooks the whole Alaba valley. Unlike most communities, the Muslims surrounding the Galiye congregation have not been aggressive in their persecution. The church was completed in about 4 months; already it has added 35 new members, which is about a 30 percent increase. (This is the church that Mom and I hiked to last May.) On Wednesday, Dec. 27, Dave and I slept overnight in the church and showed the Jesus Film. It was exciting to turn the loud speakers toward the valley and call everyone to watch the Film. As we “slept,” a hyena prowled outside the walls; his “whooah” at the door sent shivers up my spine. I was glad a strong door stood between us! The third church building to be completed is at Bedene. Kedir is the original believer in this church. We are not sure, but I think he is the very first believer from the Alaba tribe. His testimony is powerful! Before Christ, he was a committed fundamentalist Muslim. He kidnapped his Christian bride and beat her regularly when he found her praying. “I’d rather die than leave Jesus,” she repeated over and over. The night that Jesus came to Kedir in a vision she hollered, “Hallelujah! It’s Jesus!” Where once beatings and strife existed between them, now there is only tenderness and respect. What a wonderful couple they are! Kedir is one of these confident, colorful leaders. He has been through many torturous persecutions, often left for dead after beatings. He is absolutely fearless! “You will see the church in my blood!” he told those beating him. Today the building stands on the spot where they burned his Bible. 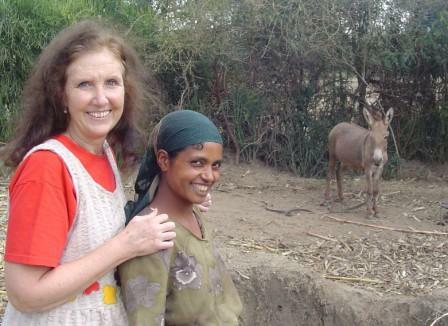 The night before we arrived (unknown to them), Kedir’s wife had a dream. “Don’t leave today. We are going to have important visitors,” she told her husband the next morning. 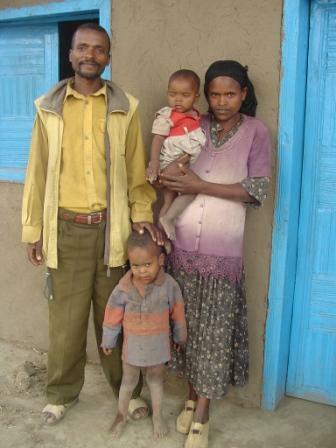 Kedir disregarded his wife, and went off to school. He almost missed our visit! But in the graciousness of our Lord, He brought Kedir back; what a joyous reunion we had! The Town Church leaders had cautioned us not to stay long at the Bedene church. It is located just down the road from a strong Muslim complex, and the persecution in recent months has been strong. They have had to take several young men into hiding because of death threats against them. The leaders were concerned about our safety. As we walked about the church, we saw the neighbors gathering in little groups, watching us. I had no fear, but the thought did occur to me that something might happen. I went inside to be with the women, and when I came out again, here was Dave, surrounded by others as he sketched a Muslim leader’s portrait! The ice had been broken. The Muslims had crossed the property boundary, and peace was evident. Our Lord can use anything to bridge the gap between peoples…even a simple portrait! Let me tell you quickly about two things that happened in the Bedene church during our visit. The most important is that while we were there a woman and a young man decided to declare that Jesus is Lord. Kedir had been speaking with both for awhile. And without any pressure, independent of each other, they chose to place their lives in the hands of Jesus. For the woman, this meant a life of secrecy; the disgrace to a Muslim husband brought by a “betraying” wife would be intolerable. Her life will likely become one of complete terror if her husband learns of her conversion. The young man will likely suffer the same fate as the other young men in this congregation; he also may have to be taken into hiding by the Town Church. For both these individuals, it was a solemn time, filled with serious decision. The second thing I’d like to tell you about shows you the importance of cultural connection. In the dark smoky recesses of the hut behind the church, an old woman was cooking a sort of corn bread on her grill over the wood fire. These women were so happy to have us there, and they were quickly putting together whatever food they could to serve us. Inside the church, they served us a large tray of enjera with some vegetable “wot” (stew). As these ladies watched in astonishment, Dave and I began to eat the food. But I didn’t realize how important it was to this old woman until I reached to take one of the corn patties she’d made. She was sitting in the background watching, and as I lifted the patty to my mouth she clapped her hands and squealed with joy. There is no better way I could have said, “I love you; I accept you,” than to eat her corn patty. 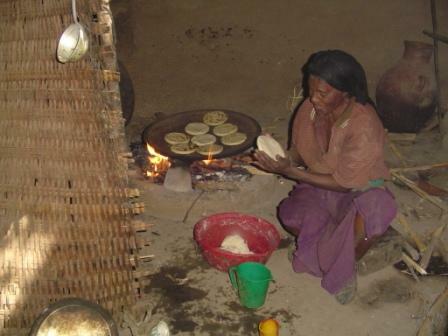 Yes, the hut was dirty; yes, the corn flour was probably polluted with dirt; yes, the bowl she mixed the corn meal in was probably filthy…but it had been cooked, and I was trusting the Lord that the heat of the fire had killed the harmful bacteria. It meant so much to these women that we accept their offerings of love! I’m sure that old woman is still talking of the joy she received that day in serving us and in being accepted by us. The final rural church that our Lord has allowed us to build is called Keranzo #1. It is near to Hajji Usman’s church at Keranzo #2. Hajji Mohammed is the founder and leader of this congregation. Many times we have told his story in our talks, website, and email prayer alerts. What an indescribable joy to be with him and his wife Fetiye again! Hajji Mohammed met us at the road and rode ahead of us on his bicycle. Fetiye held her little baby Immanuel, born after she was attacked for over an hour last spring; the knife marks were severe, but the baby in her womb was kept safe by our dear Lord. I met the donkey and christened him (her?) Masame, which means “blessing” in their tribal tongue; he was my love gift to help Fetiye bring water from the river for those building the church. We had a wonderful time at this church site. In order to protect the church building, Hajji Mohammed has been sleeping outside every night. On many occasions, the Muslims have come to do harm, but his presence has deterred their action. At times, they have gone to the other side of his property. Rather than follow them to protect his property, he has stayed at his post. As a result, he has suffered personal loss by these night marauding bands. He proudly brought us the last oranges from his orange tree; the others had been maliciously stolen, but he had safeguarded these for us! 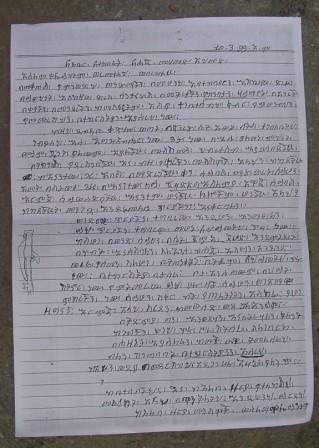 About a month before our arrival, Hajji Mohammed found a letter attached to his fence. He showed us the letter, and our son translated it for us. In brief, the letter said, “This (Christianity) is a new religion. We have been patiently waiting for you to return to Islam, but now we have no choice but to kill you. We cannot allow you to betray us any longer.” Hajji Mohammed took the letter to the government authorities, but no protection has been offered him by them. Instead, he continues to live in the joy and confidence of service to the living Lord of Lords and King of Kings, the One who is the Resurrection and the Life! Keranzo #1 isn’t finished yet. But we hope to have it completed soon. In addition to the church, we are building a new house for Hajji Mohammed; this house will have a tin roof for protection against burning. For each of these three building the church leaders gave us organized receipts; each receipt was signed by a Town Church leader, a rural church leader, and the provider of the goods. 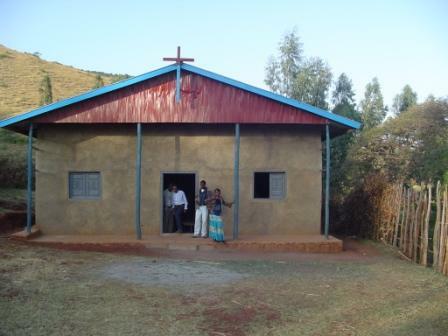 We gave $2,821 for Galiye; the Town Church added a little to complete it. We gave $3,386 for the building of Bedene; $414 remained upon completion, which is being used for the completion of Keranzo #1 (which is about two-thirds completed). Coming up next: Erecting Buildings (Continued).